Vehicle scams like title washing and odometer rollback can be exposed easily. Save yourself from some trouble by acquiring a free vehicle history report. The Oklahoma Tax Commission can be asked for car information through the request form. Contact at 405.521.3221 for questions about Oklahoma motor vehicles. For further inquiries, see the Contact page. Any person who wishes to drive a car in Oklahoma must title/register it within 30 days of obtaining ownership or entering the state. Complete and submit the application form to title your vehicle in the state. Vehicle registrations are often done with a certified Oklahoma tag agent. Check the amount of registration fee corresponding to your car’s registration age. In Oklahoma, the license plates for passenger cars generally carry three letters and three numbers. The state is among the few states that require only a rear license plate for each car. Submit the replacement form to replace your missing or damaged license plate. Oklahoma has five (5) specialty license plate types which you choose from. Take note of the requirements for each style of plate. Read the instructions carefully and fill out the form to apply for a personalized license plate. Complete the transfer request form to transfer your special license plate to another vehicle you own. You may be notified of the transfer in four weeks’ time after submitting your application. Apply for a title by completing the title form with an authorized agent. Before filling out the form, be sure that the details provided are all correct. Disclosure of wrong details can be a ground for discontinuing the title application. You may submit your application over the counter at a state titling office, or by mailing it to the address of the state’s Motor Vehicle Division (found on the form). Please check the date of your vehicle’s entry into the state or the date you were named owner. Penalties will start applying one month from the date of either occasion. Ready your money for the fees and taxes. When there’s a proposal to transfer a title between two persons, the MVD agents may solicit additional documents. The title should be signed by the registered owner and authenticated by an authorized agent. The agents will also confirm if the state approves the car’s insurance coverage. Regardless whether the car’s lien is set to be released or not, the applicant should hand over a document that verifies the current lien status. In the state, a car’s lien may move from a previous owner into the next owner. The MVD may also demand the disclosure of the recent mileage of vehicles with less than 9 years of age. A bill of sale or an equivalent may also be demanded as proof of purchase price. Drop by the Oklahoma Motor Vehicle Forms page if you want to get the needed forms for your title application. In case you have failed to find the data you were looking for on this page, you may check the official state guidelines regarding motor vehicle titling and other related content. Buying a used car in Oklahoma? Don’t make a costly mistake. 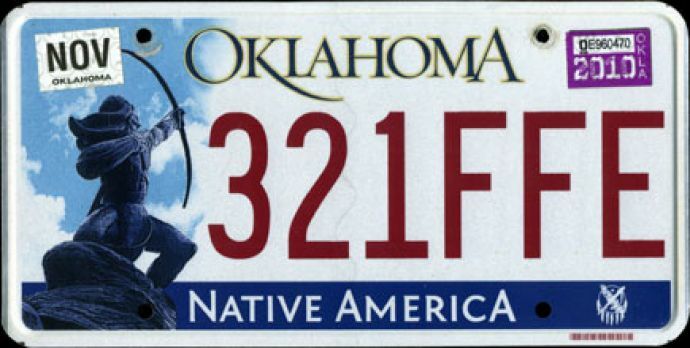 Run a Free License Plate Lookup for your Oklahoma-registered vehicle! Run a Free Oklahoma License Plate Lookup to uncover the full-story of your Oklahoma-registered vehicle.